Noted analyst Ming-Chi Kuo believes Google will unveil a next-generation Nexus 7 tablet in partnership with Asus at the search giant's upcoming Google I/O conference, looking to steal some of Apple's thunder as a next-generation iPad mini is rumored to be delayed. 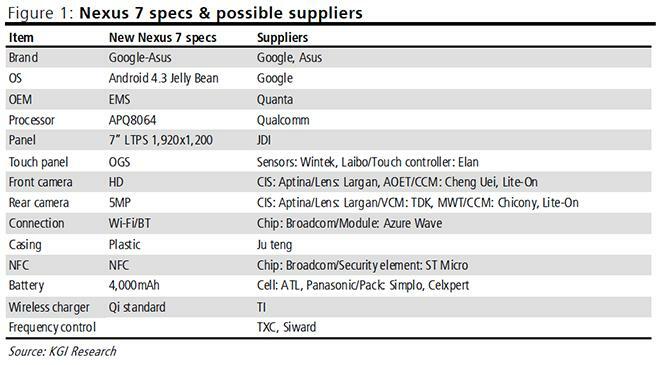 In the research note obtained by AppleInsider, Kuo notes the new Nexus 7 will feature upgraded specs, such as a high-resolution screen, better cameras and wireless charging, but will maintain an entry-level price of $199. Apple is also rumored to be launching an updated iPad mini sometime in the third quarter, but that timeline is in question as recent reports have said production of the small form factor tablet hit a snag. Google is likely to lose $5 to $10 per unit sold with the aggressive pricing, suggesting profits will come from media purchases and ad revenue. Kuo sees the distribution model being the same as 2012's version, with Google selling the Nexus 7 through its website, while Asustek and other retail outlets take care of higher-end iterations with more storage. As for major changes from the current Nexus 7, Kuo sees a switch to Qualcomm's Snapdragon S4 Pro processor, a 7-inch LTPS panel carrying a 1,980-by-1,200 pixel resolution, a 5-megapixel rear facing camera and the inclusion of Texas Instruments' Qi wireless charging. On the design side, the upcoming tablet is believed to have a narrow bezel reminiscent of the iPad mini. Regarding the tablet's operating system, the analyst believes Google will stick with Android 4.x Jelly Bean, offering tablet-centric enhancements and new functions. Android 5.0 Key Lime Pie is not expected to be a focus. Despite the update internals and unchanged price point, Kuo only expects limited year-on-year shipment growth. Finally, Kuo estimates that Google will launch an Android Book laptop, Google "over-the-top" (OTT) TV box and a smartwatch to compete with the likes of Apple, Microsoft and Amazon. These products aren't expected to make it to Google I/O, as the company is said to be in planning stages and is not yet close to manufacturing.